The American stock market isn't just sitting at record highs. It's enjoying an unusually-long period of tranquility. The last time the S&P 500 closed down by at least 1% was 81 trading days ago on October 11 -- over a month before President Donald Trump's game-changing victory. That's the longest stretch without a market plunge since 2006, according to Bespoke Investment Group. Before that, the last time there was such a long period of calm was 1995. The obvious question: How long can this last -- especially given enormous uncertainty over Trump's agenda? History shows that "things don't stay too calm or too rocky for long," LPL market strategists Burt White and Ryan Detrick wrote in a recent report. They argued the chance of higher volatility is "very high," especially because February tends to be a rocky month following elections, a time when investors have to adjust to the policies of a new administration. In post-election years, the S&P 500 has averaged a loss of 1.8% in February since 1950, the weakest month of the year. For now, the peaceful market action stands in stark contrast with the scary predictions from Wall Street stock pickers if Trump pulled off an upset by defeating Hillary Clinton. Just days before the election, Citigroup cautioned that the market could immediately plunge by as much as 5% if Trump was elected. 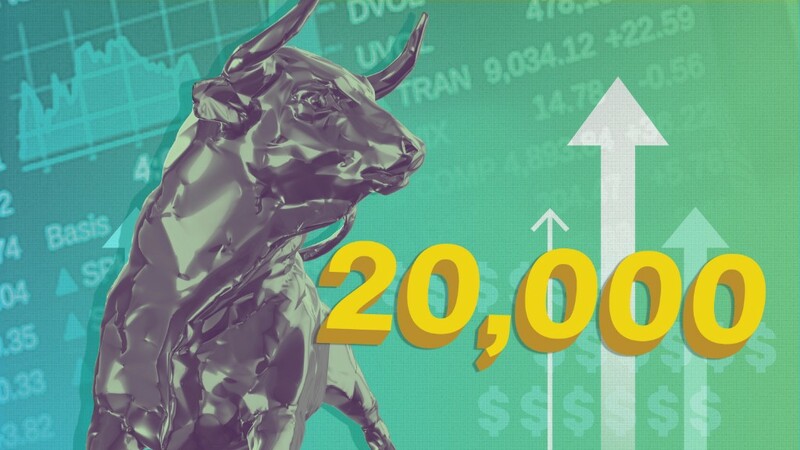 Instead, since the election the Dow has surged more than 1,700 points and late last month it surpassed the 20,000 level for the first time ever. Trump, who previously warned of a "big, fat, ugly bubble" in the market, is actively cheering for the market to go much higher. "Now we have to go up, up, up. We don't want it to stay there," Trump told ABC News after the Dow hit 20,000. Yes, a bit of nervousness did creep back onto Wall Street last week following Trump's ban on travelers from seven majority-Muslim countries. The controversial executive action raised concern among investors who wonder when Trump will get to his "pro-growth" agenda of tax cuts, regulation-busting and infrastructure spending. Yet the two-day retreat wiped just 230 points off the Dow. The index quickly rebounded and touched a new record high on Tuesday. And CNNMoney's Fear & Greed Index, which captures the pulse of investor sentiment, is once again flashing "greed." The VIX volatility index dipped below 10 last week for the first time in a decade. But it's not like stocks are going straight up either. The S&P 500's daily range -- the difference between the day's high point and low point -- hasn't moved by 1% in 36 trading days, according to LPL. That's the longest streak of that kind of stability on records going back to 1995, according to LPL. So what will cause the next market retreat? There are plenty of uncertainties that could catch the market's attention, including new doubts over the timing and structure of Trump's promised tax cuts and overhaul of the tax code. Investors also remain concerned that Trump's "America First" trade stance could backfire by sparking a trade war with China or causing the NAFTA trade deal with Mexico and Canada to unravel. Geopolitical worries are also on the rise after the White House put Iran "on notice" for launching a ballistic missile test. Tensions are likewise elevated with China, which earlier this week sailed ships near islands in the East China Sea controlled by Japan but claimed by China. Regardless of the cause, market veterans believe it would be healthy for stocks to finally take a breather. It could even provide an entry point to investors who missed the post-election move but believe it will continue. "We do expect more volatility," LPL analysts wrote, "but the data suggest equity weakness should be considered a potential buying opportunity."